Are There Signs That I Have TMJ Disorder? Having chronic pain can make a big difference in your overall lifestyle. TMJ disorder, which is an overall term for dysfunction with your temporomandibular joints (TMJs), can create constant pain in your life. The TMJs connect your both sides of your lower jaw to your skull and provide movement for your jaw and mouth. Having dysfunctional joints can make the opening and closing of your mouth troublesome. The disorder includes a wide range of symptoms, which makes it difficult to pin down and diagnose TMJ disorder. There are many people that live with pain and discomfort for years without ever realizing that their jaw joints are to blame. 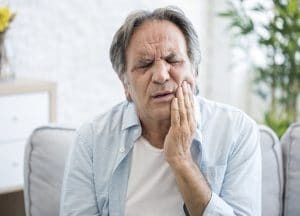 While your dentist in Lafayette, LA, may be able to best help you determine if TMJ disorder is affecting you, there are some signs that your body may be sending you. When life gets stressful or scary, you may find yourself clenching your jaw. However, if you find yourself clenching your jaw or grinding your teeth unconsciously and often, it may be a condition called bruxism. Bruxism can be caused by misalignment of your bite, which can also lead to TMJ disorder. Inversely, stress on the jaw that can be caused by years of constantly grinding the teeth can cause TMJ disorder. In different situations, TMJ disorder and bruxism be either the symptom or the cause of each other. Because TMJ disorder is often the result of a misaligned or imbalanced bite, people living with TMJ disorder can often hear or feel popping and clicking due to the jaw trying to find realign or balance itself. If your jaw often pops or clicks as you chew or talk, it could be a symptom of TMJ disorder. Consistent pain in your jaw itself might seem like an obvious sign of a joint disorder, but pain caused by TMJ disorder can include the face, the temples, earaches, headaches, shoulder, neck, and beyond. Treating TMJ disorder may offer relief to some of this constant pain. Dr. Young can help you interpret the signs that your jaw may be giving you. We proudly serve patients from Breaux Bridge, Broussard, Scott, Youngsville, and surrounding communities. To schedule a consultation, contact us at our Lafayette, LA, dentist’s office at 337-237-6453.